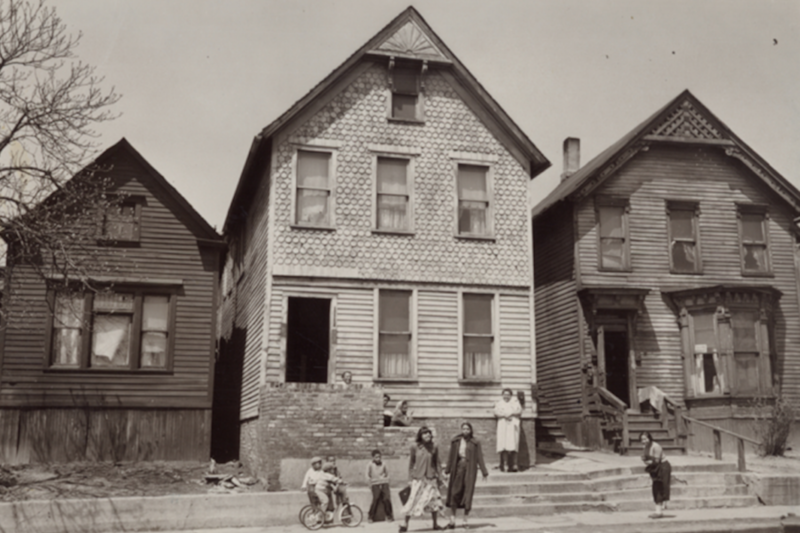 In the late summer of 1949, three little boys sat on the curb outside 1231 Riopelle St., in Detroit’s now-vanished Black Bottom neighborhood, taking in what must have been an unusual sight: A city employee was heading slowly down the street, methodically photographing each address. As the shutter snapped on a single-story triplex, two of the children grinned, while a third looked perplexed. A fourth, just stepping into the frame, glanced suspiciously at the camera. The photographer moved on. Under a tree in front of Hall’s Coal Co. on Mullett Street, a woman fed a baby in a high chair—perhaps they were avoiding a hot kitchen at midday. At 1840 Macomb, little girls in light summer dresses watched with curiosity. At the corner of Lafayette and Russell, a man in shirtsleeves leaned on a stop sign and flashed a friendly smile. The photographer took a picture and moved on. “You can see how people were reacting to this photographer moving through the neighborhood—it must have been this spectacle,” says Emily Kutil, an adjunct professor at the University of Detroit Mercy School of Architecture whose installation, Black Bottom Street View—at the Detroit Public Library’s Main Branch through March 15—has put these 70-year-old images on view the first time.